Combine this .308 Winchester load with a steady shooter and a good rifle and you have the makings of a champion! 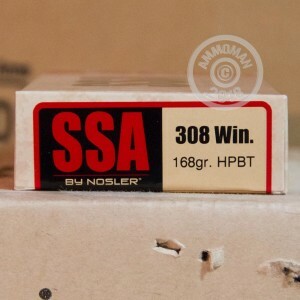 Manufactured by Silver State Armory of Packwood, Washington, these match-grade cartridges propel a 168 grain version of the tried and true Sierra MatchKing bullet to a muzzle velocity of 2,600 feet per second. 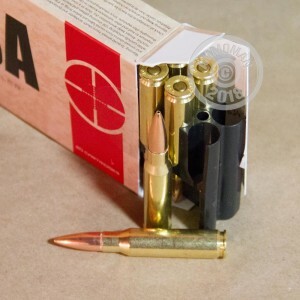 The Sierra MatchKing is a heavy, boat-tailed bullet designed not for maximum killing power but for pinpoint accuracy. It's the perfect choice for precision target shooting and competition. 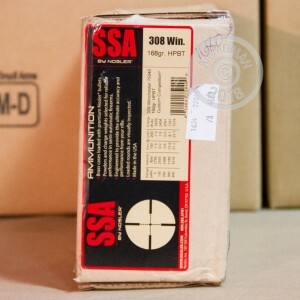 Match-grade ammo isn't cheap, but it can be less expensive at AmmoMan.com! Simply place an order for $99 or more with us and get free shipping regardless of package weight or zip code.